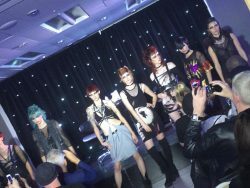 On Tuesday 20th September an evening with Fellowship Hairdresser of the Year, Andy Heasman, took place. Andy welcomed a sold-out audience to the L’Oréal Academy. Upon arrival, the guests gathered for drinks and waited for the highly anticipated show. The man of the moment, Andy, took his seat for a one to one interview with Fellowship President Bruno Marc. He started the night by congratulating Andy and explained exactly why he had achieved this recognition. 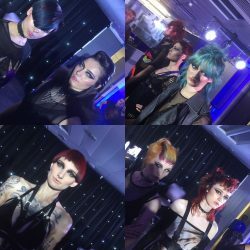 The crowd watched a short VT full of award-winning collections, inspirational shows and stunning hair created by Andy and they watched in awe as Andy worked his magic and began to work on his models. Andy introduced his first model after a short catwalk, and explained he would be creating a “romantic feel”. He continued with the model, describing the natural curl look as a “vibrant finish”. Rush’s Art Team Colour Director, Chris Williams, joined Andy on stage and he described each models colour. Whilst Andy continued to work on his first model, a second joined him on stage. The second model reflected the chosen “punk theme” with a simplistic bowl shape cut. Andy created a bold, fun fringe, which enhanced this strong look. The last demo saw Andy welcome a further three models one at a time. Andy described the look as a “busy look working with the idea of an expensive punk”. The first model had a dressed out square shape, whilst the second featured an undercutting technique. Chris highlighted the second look with a dash of colour and the final presentation was about the styling of the model. To ensure Andy finished the show with a show stopper, he created a slicked back look. During the finale, Bruno returned to join Andy on stage. The pair reflected on what winning Fellowship Hairdresser of the Year meant to him, it was refreshing to hear Andy describe how much of a bond he has with Fellowship Events Manager, Ann Herman. He spoke about what the future holds for him and his journey at RUSH. A quick question and answer session with the audience followed and Rush’s Editorial Director, Tina Farey joined Andy on stage. The pair thanked the audience for coming and final looks paraded down the catwalk.